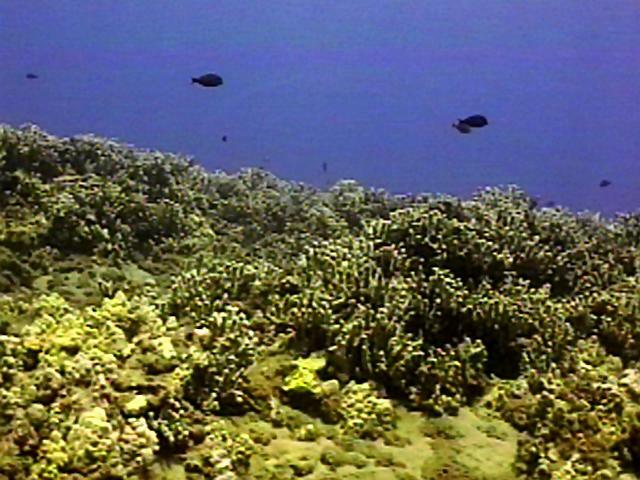 In our first weekly summary for '98, we reported that Honokowai was undergoing another Cladophora algae bloom, similar to those of '89 and '91. For a while, it looked as though we might be diving all summer in the kind of green slimy soup that had driven us nuts in those two years. 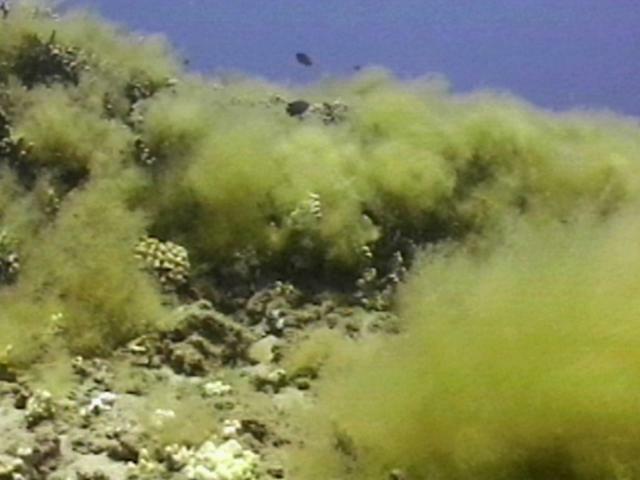 When a swell rolled in last week, we expected it to rip the algae from the reefs where it had been choking the coral, and distribute it far and wide the way it did in '89 and '91. We got a suprise, however. Instead of spreading the Cladophora around, the waves took it... away. Somewhere. We don't know where, but we do know it's all but disappeared. There are still small traces of Cladophora clinging to some parts of the reefs, but it certainly doesn't appear to be much of a threat anymore. That was then... ...and this is now. As divers, we usually hate to see swells rise up, because they stir up the water and make diving from shore difficult. This one, however, did us a huge favour. Once again, we were reminded that just when you think you are starting to understand the ocean, you're probably about to be put in your place. Since we arrived on Maui, we've been in constant communication with George Balazs. We informed George about Raphael's case of "Clingons", hoping for insight, which we got. We've received permission to post his response to Turtle Trax. I think I know what they are. 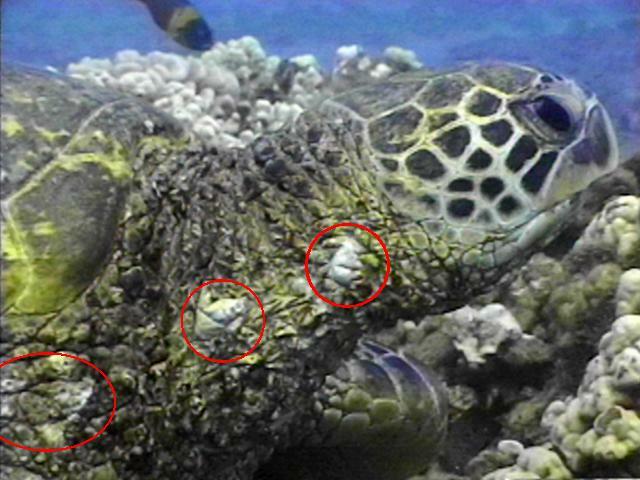 A skin barnacle we've seen only three times only from Maui on dead near dead turtles sent to us. It's a type sort of like platylepus hexastylos, but larger and packed closer together. This week George sent us a paper on barnacles. We looked through the drawings and photos in there, and the only one that these Clingons look similar to is indeed the hexastylos. We'd also agree with George's wording "a type sort of like", meaning we don't think it's the same barnacle. 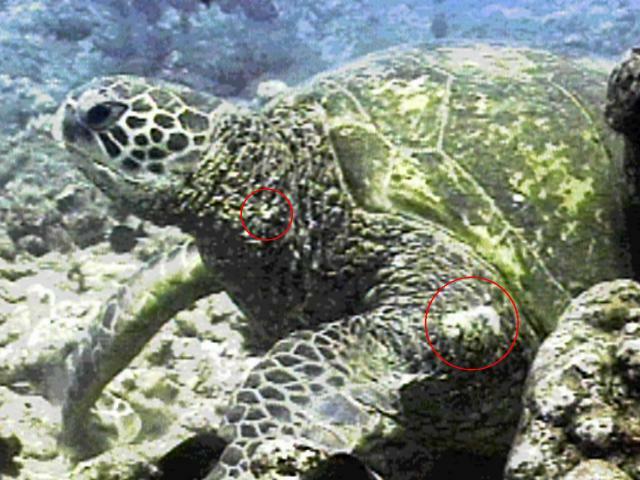 What we've found significant (and worrisome) is that George has seen these Clingons just three times on "dead near dead turtles" and only on Maui turtles. As of right now we've confirmed nine cases here at Honokowai and we suspect there are others. One step forward--could the next step be back? Tutu is a very special turtle. We have known her since 1990 and even then she had tags. She also had tumors, the largest appearing over both her eyes. We encourage you to read her biography to learn more about her. The word "Tutu" is Hawaiian for "grandmother." Tutu is tag U 521. Among her innumerable good qualities, she is our very first FP regression case. She taught us that fibropapilloma tumors are not necessarily a death sentence and that you can fight your way back. Last year, Tutu was just fine. Well, this summer she's got alarming whitish blotches on her neck and shoulders. Considering that she developed these over the ten months since last we met, we are really concerned. If our first regression case is now having a setback, what does that imply for all the others? We remember Raphael (known since 1992 and also a regression case) showing the same kind of white blotching back in 1996 (and we remember expecting a recurrence of FP then too). In '98, however, Raphael showed up filthy with Clingons instead: white rings around all appendages, each hosting a load of pulsating barnacles. We are posting two images of Tutu for your information. This is the closest we ever got to her and we strained our eyes to figure out if we were looking at some kind of precursor to FP. Underwater neither of us could make any determination, although we both feel almost certain that we are not looking at FP. There's a little turtle here. She makes her home under a narrow ledge just large enough to accommodate her. At first, she'd lift and leave as soon as we came into view. It took several "meetings" before we managed to get both left and right profiles. Once we were successful, we entered her into our database. She is 1998 Turtle 57. With each encounter, her urgency to leave grew less. Rather than bolt, she'd just lift quickly for air. After a few more occasions, she merely lifted, looking back at us checking to see if she was being pursued. Of course she wasn't. Then, on one wonderful day, she didn't leave at all. She was out by her ledge, enjoying the Maui sun and rocking in the swells. We approached, enthralled, and she allowed us near. Trust. She was out by her ledge, enjoying the Maui sun and rocking in the swells. We've lost count of the number of times that special moment has happened--when a turtle originally frightened of us has finally concluded that we aren't a threat. The exhilaration of that instant--when we are "accepted"--never dims. Being accepted by this cute little honu is just as gratifying as that first time, when Clothahump decided that those two big bubbly things in her ocean were safe to approach. As soon as we got back to our apartment, we went to our Hawaiian dictionary. We typically do this when we decide a honu should be named. 1998 Turtle 57 is now Makana, Hawaiian for "gift." 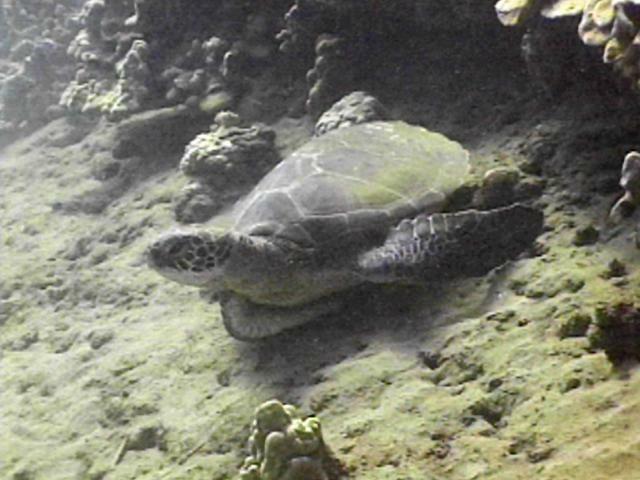 Makana is a gift from the Shoals, the nesting grounds for the Hawaiian green sea turtle. This year marks the 25th Anniversary of the tagging programme there, initiated by pioneer researcher George H. Balazs. Since naming her, we've had many enjoyable interactions with Makana. Yet there is sadness. If Makana continues to call Honokowai home, she, like all the other "recruits" (the very young who settle into an area), will become sick with fibropapilloma tumors within two to three years. Then, like all the other youngsters before her, Makana's condition will worsen and she too will disappear from our lives.